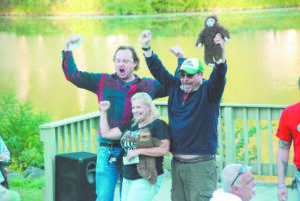 The top three adult winners of the Sasquatch Calling Contest. That was what one attendee of Whitehall’s third annual Sasquatch Calling Festival had to say upon seeing the cars lining Skenesborough Drive. It was impossible not to notice the scope of the festival as one turned onto Skenesborough Drive, which had cars lining both sides of the roadway for its entire length. In fact, the drive was reduced to one lane of travel for most of the day. Although Whitehall’s claim to fame once centered on the town being the Birthplace of the U.S. Navy, the rural community drew a steady and considerable crowd of Sasquatch hunters and enthusiasts from across the northeast including folks sporting license plates from Vermont, New Jersey, Rhode Island and Massachusetts.